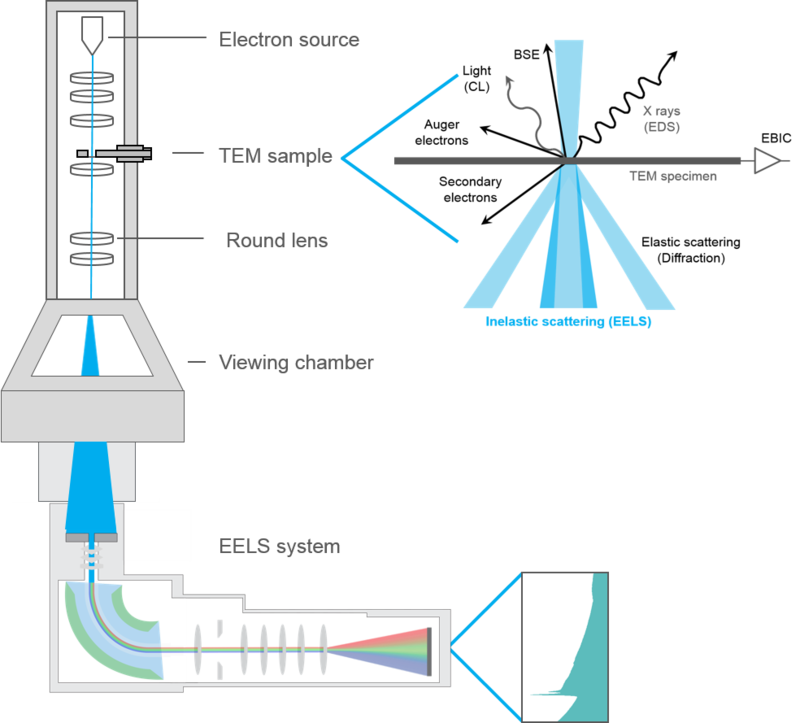 Electron energy loss spectroscopy (EELS) is the use of the energy distribution of electrons that pass through a thin sample to analyze the content of the sample and create images with unique contrast effects. EELS instrumentation is typically incorporated into a transmission electron microscope (TEM) or a scanning TEM (STEM). These microscope types use high energy electrons (60 – 300 kV typically) to interrogate the sample. As the name implies, the electrons must “transmit” through the sample and thus requires an electron transparent sample. The electrons can interact either elastically (no energy exchange) or inelastically with the sample, and it is these interactions that EELS exploits to extract information about the sample. A typical energy loss spectrum. 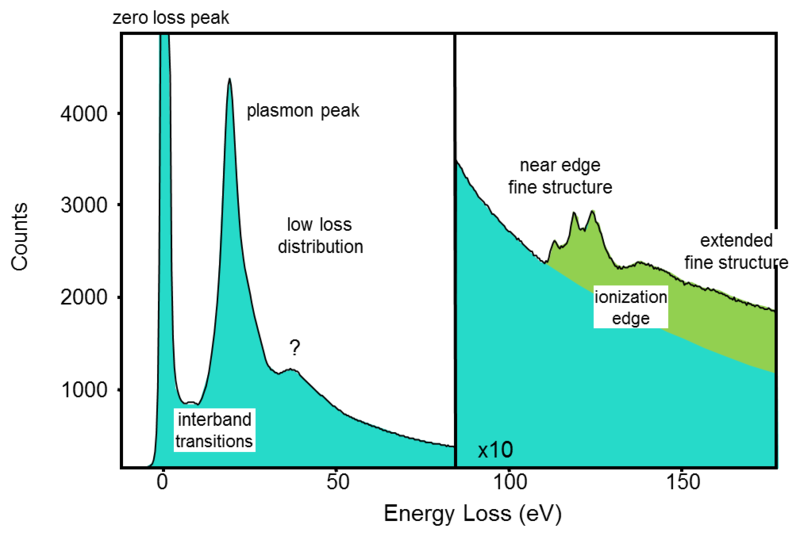 The spectrum has many prominent features and is typically separated into three regions: electrons that have not lost energy (zero-loss peak), electrons that have interacted with the weakly bound electrons in the sample (low-loss distribution), and the electrons that have interacted with the tightly bound core electrons of the atoms (the ionization edges or core-loss region). In addition to these spectrally related signals, you can create images by filtering in energy space (e.g., allows only the zero-loss electrons to form the image) can improve the contrast and resolution of the image and create unique image contrast. The main limitation of the EELS technique is the effect of sample thickness. As the sample thickness increases, the strong interaction of primary electrons within the sample results in the electrons undergoing multiple energy loss events. This tends to reduce the signal-to-background ratio of the EELS edges, reducing the visibility of the edges. However, since the spatial resolution of transmission electron microscope techniques is also reduced as the thickness increases, this loss of the edge visibility is not always the largest impediment to quality data.